It has long been the marketers objective to encourage as many shoppers to complete the path to purchase. But in the modern, digital age, shoppers interact with brands in a more complex fashion, where one interaction can spur new ideas, putting them on an entirely new product purchase path. 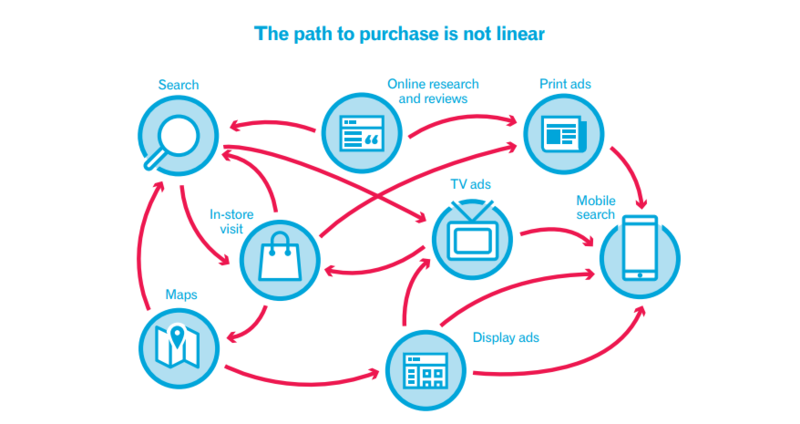 Experian published this diagram of the new Path to Purchase – depicting how shoppers interact with a brand before purchasing a product. How does influencer marketing impact the path to purchase? In this new digital age, where influencer marketing is a tactic used by almost all shopper marketers, what kind of role are influencers playing to encourage shoppers to make a purchase? This article will explore 5 ways influencers are helping brands engage shoppers, encouraging them to move from brand awareness, to consideration, to purchase and even to becoming new brand advocates themselves. Influencers offer targeted reach for brands wanting to boost awareness of their brand and products. By working with influencer marketing agencies, marketers can select influencers who match the needs who have the attention and trust of their target buyer. Whether a brand is partnering with a celebrity who has millions of followers, or with a micro influencer who can reach thousands, marketers can utilize their niche category expertise to create engaging content that educates consumers on their brand and products. An influencer’s participation in a campaign is viewed as an authentic endorsement by their audience. Influencers attract long-term customers because their audience are already engaged with the topic that an influencer specifies in writing about. The audience of influencers with smaller followings (often known as micro-influencers) are more likely to share mutual interests with the influencer, and with each other, than a larger audience of millions. The blogger often interacts with individuals in the comments of their content, and a friend-like relationship is built. Part of the “consideration” stage in the traditional path to purchase often involves research on the part of the consumer. They may weigh their options against competitors, or even decide whether they need the product at all. Talented influencers interpret the messaging for the brand in a way that is interesting to their following, but still follows what the brand wants to share with their target customers. They create inspiring and informative content that shows off the products in real-life settings. Their content is expertly produced through photos, videos, and stories, published on blogs and social media. Sometimes influencers produce how-to live videos that show off how the product is used, with ideas that can easily be reproduced by their audience. Working with the brands, and influencer marketing agencies handling the campaign, influencers are able to offer direct discounts, and promotions that encourage consumers to purchase the product. Social media networks have also made it much simpler to purchase products directly through influencer content with click-to-buy links, and product tagging in photos. As brands see the results from influencer marketing they are making a more concentrated effort to develop long-term relationships with influencers who they’ve found success with. An ongoing relationship, with many products championed by the same influencer, gives brands a better chance of converting their audience to new loyal consumers. Those shoppers who tried the product through the endorsement of the influencer may also become new advocates themselves.